I am so mad at Kansas. Kansas, I have a bone to pick with you. You are annoyingly far from California. Boo to you. Boo to you for taking back my lovely visitors Amy and Meg. But yay to you for loaning them to me for the weekend. Thank you for coming to visit. Thank you for being silly and being real. But no thanks to you for not living next door. Allegiant Air, take me away. 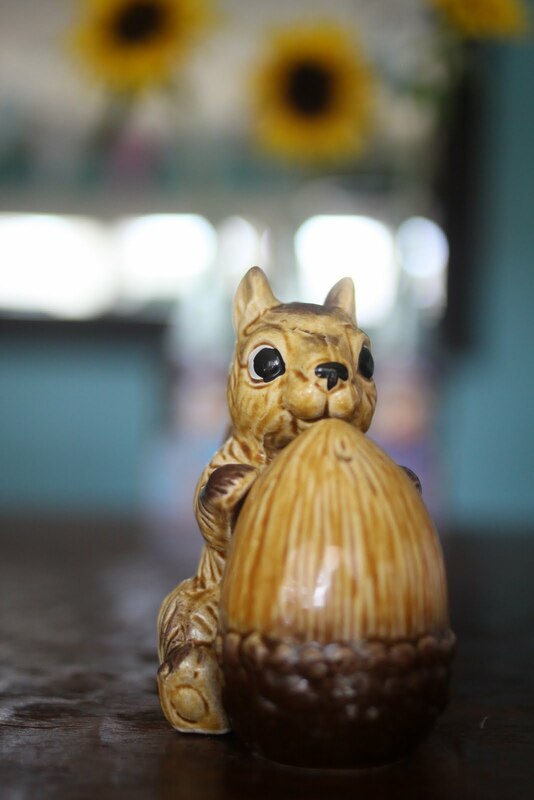 Until then, this happy squirrel salt and pepper will just have to keep me company. Distance stinks! Great friendships can conquer all distances though, glad you had a super fun weekend. Can't wait to see some pics! sorry... it's never fun when good times have to end! Glad that you had such a good time with them. Sorry it was so quick. best quotes from the weekend. "but this is my therapy...(fill in the blank)"
best food from the weekend. ANYTHING that you whipped up...esp toffee crack...which i already made! i had mucho fun julie!!!! Yeah for you, sounds like a fun weekend! girl's weekend sounds amazing! I am gonna have to take me one-a those! I didn't get to thank you enough for the headband. You are soooo sweet! It has been worn by at least on of my girls every day since we received it! Thank you! Kansas is far....from everything! But, has the most beautiful sunsets. Sounds like a wonderful weekend! Yay for friend weekends! jealous. glad you had so much fun, but so jealous. a girls weekend sounds dreamy about now. sweet Julie. AZ is close to CA. come anytime! I hate that Kansas is so far from everything, too... I live in the same town as Meg, so I totally understand that. But you girls had loads of FUN, yeahhhh!